Cotton is a natural material that comes from cotton plants which grow in hot countries like India. It is a soft, white fibre that that is used to make clothes because is: cheaper, more comfortable to wear and easier to wash than wool. Originally, cotton fibres were twisted together with a wooden spinning wheel to form threads of yarn which were then woven together to make cloth using a device called a loom. Families often farmed land during the day and then made cloth at home in the evening. The women would do the spinning, whilst the men would do the weaving. It was called a 'cottage industry'. Early cotton mills were built near to rivers and used large water wheels to power the machines inside them. In 1781, Sir Richard Arkwright opened the world's first steam-powered textile mill on Miller Street in Manchester. When Boulton and Watt developed a more efficient steam engine in 1783, the textile industry grew rapidly. 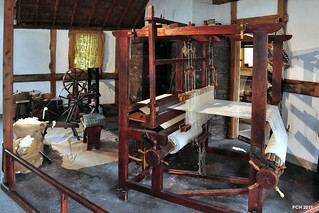 Textiles like cloth and carpets could be produced quickly and sold across the world. Lancashire's damp climate made it perfect for keeping cotton yarns moist and unlikely to break so it became the centre of the industrial revolution in Britain. Lots of people moved away from the countryside to work in the mills. Manchester had 108 mills by 1853 and it became known as 'Cottonopolis'. The Bridgewater Canal, connecting Manchester with the port of Liverpool, was built to move large amounts of raw cotton and finished cloths around. The mills were hot and dusty places so they were hard to breathe in. People had to shout above the rattle and hiss of machinery, which were deafeningly noisy. Women were employed to do the spinning and weaving and the men would oversee them to make sure they did not break the rules or fall asleep. Small children called 'scavengers' were used for cleaning out machinery whilst they were running so it was very dangerous. Many lost fingers and some were killed. Wages were low and people worked for up to 12 hours a day in the mills because their owners wanted to make as much money as possible. Streets of small, cheap houses were built nearby. People walked to work early in the morning and walked back at night. Often, whole families shared a single room. They suffered from bad health because they could not afford: good food, warm clothes or medicines.